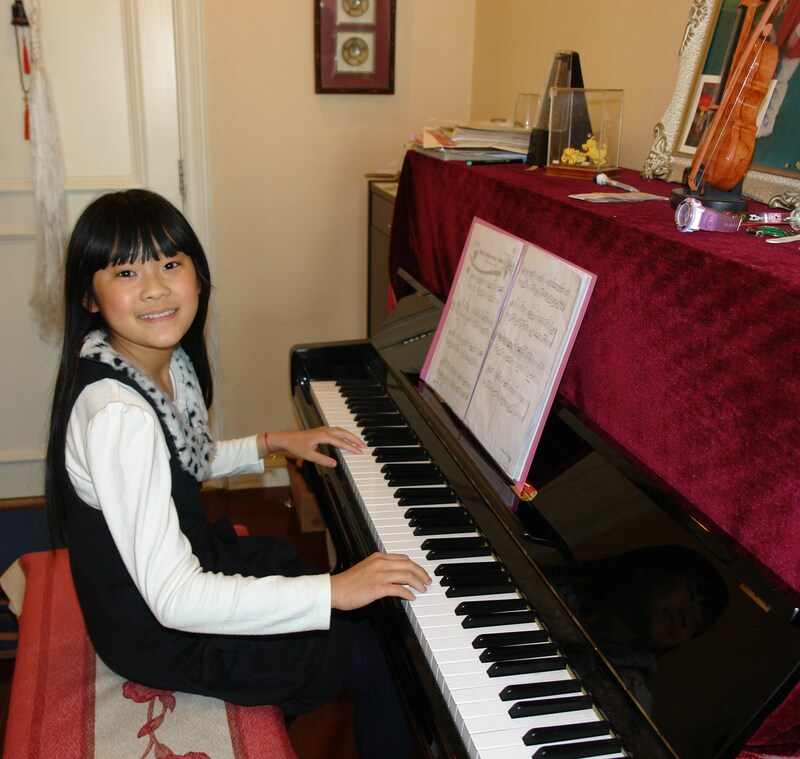 When we originally met in the elevator of our apartment building, Sandra was taken by Yi yi and her happy energy. On another occasion, when Sandra was shopping at the veggie markets, she met Song and have been close ever since. Keep in mind, Song only speaks Chinese. Sandra only speaks a little Chinese. But hugs and kisses translate in any country. Song, who is this lovely Grandmother, Yi yi (“Poppy”)the 11 year old granddaughter, and Long li(“Crystal),her Mother. Song is so sweet. She has adopted Sandra and family since they are so far from our family. For a play date with Yiyi & Sepia, Song proceeded to give us caramel popcorn, candies, seed snacks, and some fruit. We thought this must be a Chinese tradition to give lots of gifts….But Song is constantly giving us various Chinese delicacies. 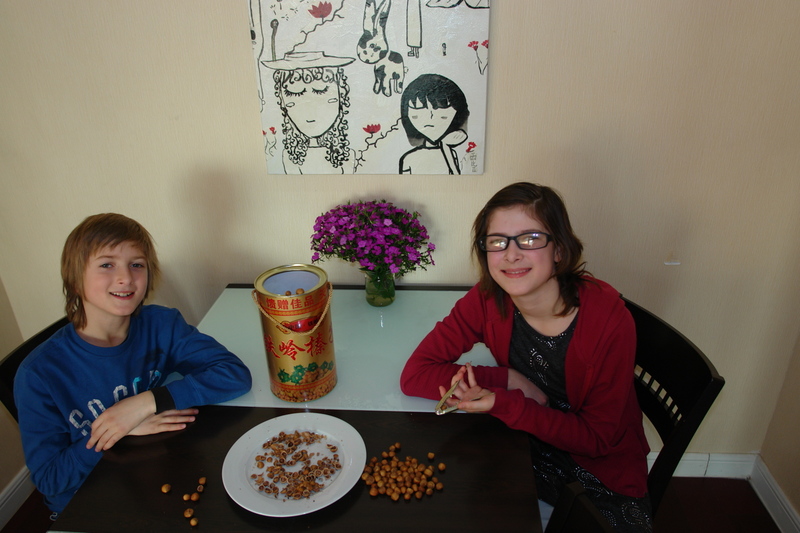 Extra large tin of delicious mini hazelnuts from our friends. Another time, Long li(Song’s daughter) came and gave Sandra a private yoga lesson. 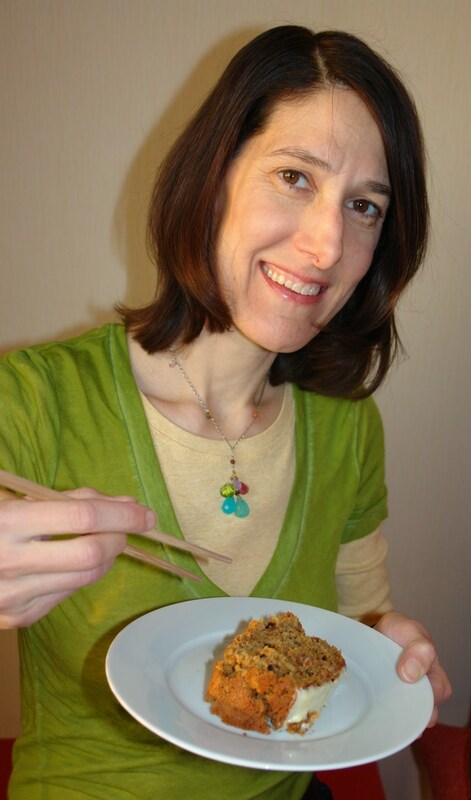 She is an excellent teacher and can speak a little English. She is still traveling back and forth to Sanya (which is like China’s Hawaii) to complete her yoga training. And another occasion, Song asked if Sandra could come to their apartment a few days before the Chinese New Year. She gave us a large squid (which was air freighted from their Uncle on the coast of China), snacks, Chinese red dates, organic corn, pumpkin, cucumbers, and a stuffed Chinese meat ball (about the size of a grapefruit). Sandra decided to have a quiet celebration with these special friends on the weekend. On Sandra’s actual birthday 2/15, Song and Yi yi came by with containers of fresh strawberries and blueberries and some chocolates. Sandra “tried” to asked (with the help of her Google translate phone) if they could come over for tea and cake on Saturday at 2pm. Saturday morning Sepia and Shane made a beautiful handmade Carrot Cake with Lemon cream cheese icing to have for the celebration with friends. At a couple minutes after 2pm, Yiyi called and asked if we were still coming over? Turns out, they thought Sandra invited herself and family to come to their apartment and she wanted them to serve cake and tea!! We quickly went to their apartment and brought Sandra’s b-day cake and chocolate dipped strawberries which Shane and Sepia made as well. They had bought 4 different types of mini cakes, prepared sliced fruit, and had tea ready for us. We had a great laugh about the confusion and had a feast! We sang “Happy Birthday” in Chinese and English. Eating birthday cake with chopsticks. 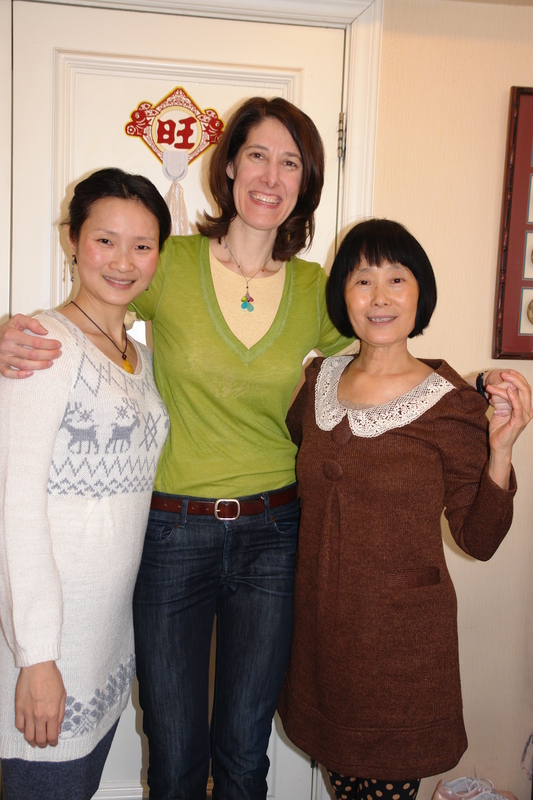 Last month, Song and Longli invited Sandra to make Dumpling (jaozi) from scratch. Rolling out the miniature circles to then fill with delicious filling. 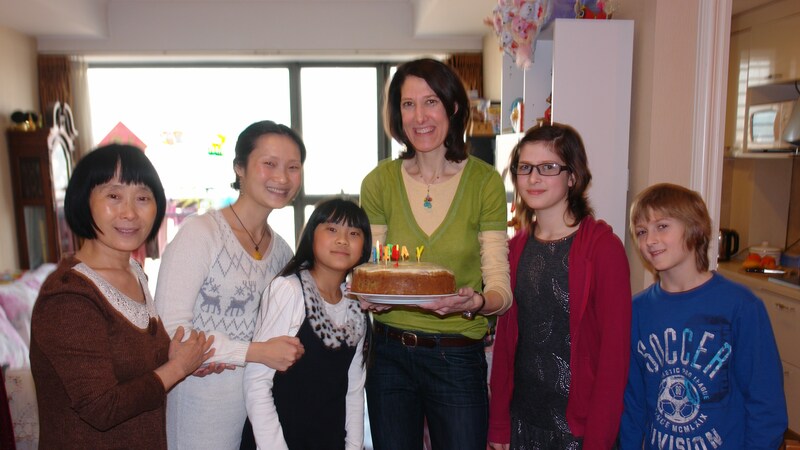 It was so much fun for Sandra learning new Chinese words and cooking with them. They then steamed the dumplings and had a delicious lunch together. This entry was posted in Lifestyle and tagged Beijing, Birthday, Friends by skatsoolis. Bookmark the permalink.